Arthur Asher Miller was an American playwright, essayist, and figure in twentieth-century American theatre. Among his most popular plays are All My Sons , Death of a Salesman , The Crucible and A View from the Bridge . He also wrote several screenplays and was most noted for his work on The Misfits . The drama Death of a Salesman has been numbered on the short list of finest American plays in the 20th century alongside Long Day's Journey into Night and A Streetcar Named Desire. 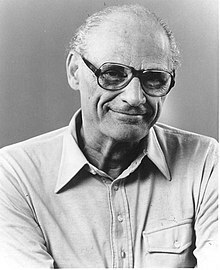 Arthur Asher Miller (October 17, 1915 – February 10, 2005) was an American playwright, essayist, and figure in twentieth-century American theatre. Among his most popular plays are All My Sons (1947), Death of a Salesman (1949), The Crucible (1953) and A View from the Bridge (1955, revised 1956). He also wrote several screenplays and was most noted for his work on The Misfits (1961). The drama Death of a Salesman has been numbered on the short list of finest American plays in the 20th century alongside Long Day's Journey into Night and A Streetcar Named Desire. Miller was often in the public eye, particularly during the late 1940s, 1950s and early 1960s. During this time, he was awarded the Pulitzer Prize for Drama; testified before the House Un-American Activities Committee; and was married to Marilyn Monroe. In 1980, Miller received the St. Louis Literary Award from the Saint Louis University Library Associates. He received the Prince of Asturias Award and the Praemium Imperiale prize in 2002 and the Jerusalem Prize in 2003, as well as the Dorothy and Lillian Gish Lifetime Achievement Award. Marilyn Monroe and Arthur Miller at a press conference.